When you get down to it, candy is pretty awesome. From a young age, most people sample a wide range of candy and, for the most part, tend to develop favorites. 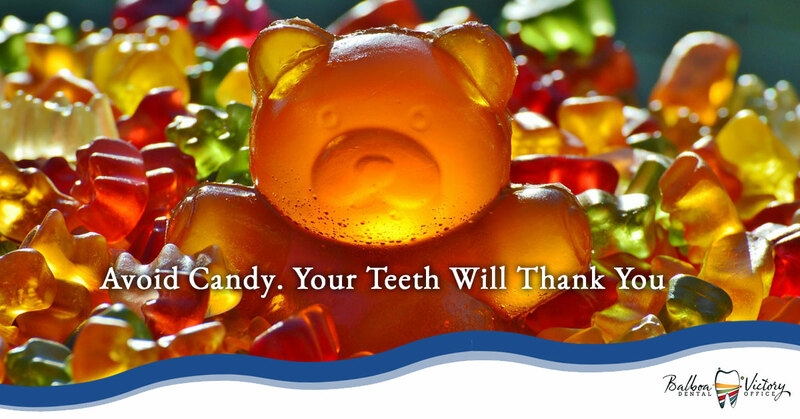 Here at Balboa Victory Dental, we know that we cannot convince everyone to avoid candy. However, in today’s post we are going to list out some of the most harmful candies that people tend to eat in the hopes that maybe, just maybe, a few of our readers will listen to our advice and avoid these candies as much as possible. If you haven’t read our previous post on the subject, we suggest that you go back and do so. If you’d rather dive right in and read the other blog later, however, that’s totally fine also. Keep reading below to learn a little more about candy that you should avoid. With Halloween just around the corner, we understand that people are going to be eating a little more candy than normal. While it is fun to indulge in sweets, we want to make sure that all of our readers know exactly what they are getting themselves into when they decide to eat certain candy. Below, we have listed out a couple more of the most harmful sweets that you are likely to encounter this Halloween. Hard Candy: This type of candy is loved by nearly every person currently reading this blog post. Hard candy comes in many shapes and forms. Unfortunately, it is also one of the worst types of candy for your mouth. You see, people tend to leave hard candy in their mouth for a long time as they enjoy the flood of sugary flavor. Because of this, a large amount of sugar tends to coat a person’s teeth. As we have stated before, the bacteria in the mouth love to eat sugar and, as they eat it, they produce acid that has all sorts of nasty side effects. If this isn’t bad enough, hard candy can also cause chipping and breaking of a person’s teeth if they decide to chomp down on it before it is soft enough to be crushed. Powder Candy: Chances are, you have probably had some form of powdery candy. Most often, these powders come in small tubes that are poured into the mouth or, in some cases, come in pouches and are meant to be scooped out with a provided piece of unflavored packed-sugar hard candy. This type of candy is bad because you are literally just pouring sugar straight into your mouth. This form of candy quickly coats the entirety of your mouth, allowing the bacteria in your mouth to have a field day. In our opinion, this type of candy should be avoided at all costs. Thank you for taking the time to read our short blog series on the most harmful types of candy for your teeth. Remember, if you want to enjoy candy, do so in a responsible way. After consuming candy, be sure to drink plenty of water in order to wash away the majority of sugar that has coated your teeth. While this won’t completely negate the effects of the sugar, it will go a long way in helping to reduce the harmful effects that sugar can have. If you’re worried that you may have already enjoyed enough candy to harm your teeth, please contact us today at Balboa Victory Dental. We are a full service, Encino area dentist office and we’ll make sure that your teeth are as healthy as possible!